Dryer vent cleaning kits are the easiest way to ensure the inside of your dryer vent is properly clean and free of debris. Around 3,000 fires occur every year in the United States due to clothes dryers. And getting lint off the removable filter is not enough, as the lint travels down into the dryer vent, hose or duct (Source). When this buildup of lint becomes too much, it can disrupt the regular operations of the dryer. Clothes take longer to dry, the outside of the dryer gets very hot, and in the worst case scenario a fire can start. By having a dryer vent cleaning kit, you can prevent these issues. Finding the right kit can be confusing, especially if you have not bought one before. It is why we came up with a guide that highlights the five best dryer vent cleaning kits that are available today. 6.1 What is a Dryer Vent Cleaning Kit? 6.2 Do I Need a Dryer Vent Cleaning Kit? 6.3 What Happens If a Dryer Is Not Cleaned? 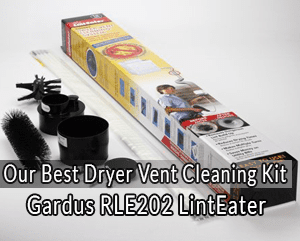 The Gardus RLE202 is the best dryer vent cleaning kit that you can buy with the money. It is a 10-piece kit that gives you every tool or accessory that is required to clean a dryer vent. 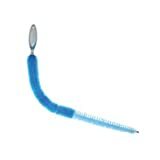 The 10-piece kit includes helpful tools such as 36-inch flexible rods, blockage removal tool, self-feeding Augur brush and vacuum adapter. There is even a lint brush and a dryer adapter in the kit. Removing lint from within your clothes dryer is a piece of cake when you have this accessory on your side. Thanks to the different cleaning attachments, you can get into the dryer vent, crevices and other areas without a problem. And with the four flexible rods, you can even make a dent in the amount of lint that is collected in your dryer duct! 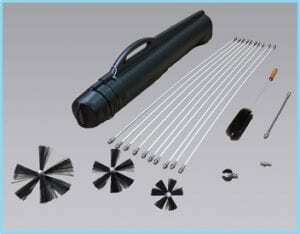 Kit includes ten pieces, providing the full slate of accessories needed to clean a dryer vent. Features a vacuum adapter for quicker and more powerful cleaning. Includes four flexible rods that can be used to clean a dryer duct. Homeowners who are looking for something a little simpler will be very happy with the Mountain Trades Dryer Cleaning Kit. It is a two-piece kit that comes with a dryer vent cleaning brush and a vacuum adapter. The cleaning brush is perfect for getting inside the dryer vent and ensuring that you are getting all the major bits of lint. Then you can use the vacuum adapter to ensure that you are sucking deep inside the vent to remove any lint that may be present. Another run through with the brush should finish the job. You can even use the brush to see if there is lint in any other crevices or areas of the dryer that are accessible. This will help ensure that you are getting as much lint out of the dryer as possible. The vacuum hose that you are getting is 24 inches, while the flexible dryer vent cleaning brush is 28 inches. You can even use the dryer brush on refrigerator coils, if you need to clean those. Includes the two major elements you need in a cleaning kit: cleaning brush and vacuum adapter. Customer reviews suggest the dryer brush is very durable, which means it should last you through many years of use. Does not include an auger brush. 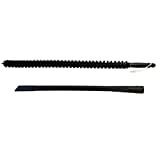 Another two-piece dryer vent cleaning kit, the Dryer Vent Store Dryer Duct Cleaning Kit will come in handy when you want to clean your dryer vents and ducts. The kit includes two pieces, a 24-inch crevice tool and a 30-inch brush. The crevice tool is meant to go on your vacuum, as it enables you to use the suction power of the vacuum to clean out the lint from your dryer vent. While the manufacturer claims the crevice tool can be useful for cleaning the dryer duct, we would recommend a more powerful solution. The amount of lint in those ducts can be very overwhelming. But for cleaning your dryer vent and other crevices within the dryer, this kit is very handy. The brush tool is also useful if you want to get some of the lint out without using a vacuum. You should be able to fit the brush into any exposed crevices of the dryer where lint can collect. Includes a dryer cleaning brush and vacuum attachment. Tools also work with refrigerator coils and condenser coils. As it is missing connector rods, using the brush to clean a dryer duct would not be very effective. Customers who want to buy the cheapest possible dryer vent cleaning solution will be happy with the Appliance Brush Set from General Electric. While the product is not made solely for dryer vents, it works very well for that purpose. It is a set of two brushes, with the first one being a lot thicker than the other. If the thicker brush does not fit in the vent of your dryer, you will be able to use the thinner brush without any issues. It will do a good job at cleaning, while you can also use the accessory on refrigerator and HVAC coils. 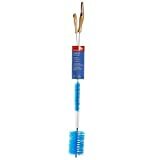 Comes with two brushes, which is useful for thicker/thinner dryer vents. Does not include a vacuum attachment or any other accessories. Another budget dryer vent cleaning tool, the Mr. Clean Appliance Vent Brush is about as basic as you can get. But the good news is that it still does a very good job, as it will effectively clean out your dryer vent. It is a single brush, but the thickness varies from one end to the other. So you should be able to fit one of the ends into your dryer vent to get out the lint that is stuck in there. It is also stated to work for cleaning refrigerators, ceiling fans, radiator vents and more. Single brush that will do the job of cleaning your dryer vent. Flexible wire on the brush will reach spaces in the vent that are hard to reach. No vacuum adapter or other accessory. What is a Dryer Vent Cleaning Kit? A dryer vent cleaning kit is a set of tools that you can use to clean your dryer from the inside. The goal of the kit is to make it easier for you to get lint out of the dryer vent and other crevices inside the dryer. The reason why a dryer vent cleaning kit is necessary is because you will not have another way to get into the narrow passages, vents and crevices that are inside your driver. Using a typical duster or similar contraption will not work, as they will not fit inside the dryer. While it may be possible to create a DIY dryer vent cleaning kit, buying the different parts can end up costing more than one of the kits in our guide. And it is always better to go with a kit, as each part is specifically designed with the purpose of cleaning a dryer vent. 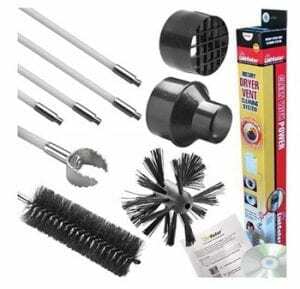 Most dryer vent cleaning kits will consist of different bristled brushes, which are placed onto rods of various sizes. There will be special tools in the kits as well, such as blockage removal tools, self-feeding brushes, vacuum adapters and more. Each accessory is designed to help you pull out lint from the dryer. Do I Need a Dryer Vent Cleaning Kit? If you live in a home with a dryer, there is a good chance you need a dryer vent cleaning kit. Most homeowners believe that it is fine if they are leaving their dryer as is. They assume the dryer has some self-cleaning mechanism that will take care of the lint that is building up inside the machine. But that is not how it works. In fact, most modern dryers only have a single removable filter where some of the lint is caught. If you are lucky, removing the lint from this filter after each laundry cycle is enough. The dryer will remain in good operation. But that is only if you are lucky. It is still not a good idea to leave your dryer in such a state. Most homeowners do not realize that a significant amount of lint gets into the different openings, vents and crevices that are in the dryer. And this lint is not being caught by the removable filter, which means that it will stay in place even after you have cleaned the filter. Of course, you could contact a professional and have them come to your home and clean the dryer. But they will charge you at least $200, if not more. Unless you are happy to pay that amount every six months, you may want to go with a dryer vent cleaning kit. What Happens If a Dryer Is Not Cleaned? Ever noticed that your clothes have a lot of lint on them when they are coming out of the dryer? When this is happening even after you clean the removable filter before each load, it means that your dryer has a buildup of lint somewhere inside. Another side effect of not properly cleaning a dryer vent is that your clothes will take longer to dry. If you normally run your clothes in the dryer for 60 minutes and they are done, you should continue to expect this performance. One day you look inside the dryer after 60 minutes and you notice some clothes are still wet. It means your dryer has lost performance and the culprit is lint! It is also possible that too much lint in the dryer will cause its different components to work harder than necessary. And the result is premature failure of one or more components within the dryer. We know that when a dryer component fails, it means potentially hundreds of dollars in repair costs. And that is if you are lucky enough to get it repaired. Most people end up needing a new dryer. The final and most dangerous side effect of not cleaning a dryer with a dryer vent cleaning kit is a house fire. It is the worst-case scenario, but it can happen. There were around 3000 house fires in the past year in the United States, caused by dirty dryer vents. An overworked dryer can easily blow a circuit or start a fire in your home. Do not take a chance, when you can get a dryer vent cleaning kit to remove all that lint from the dryer. There are some components that you should expect to find in a quality dryer vent cleaning kit. Any dryer vent cleaning kit that you buy should include a cleaning brush. If you are seeing a kit advertised for sale, but it does not include a cleaning brush, move right by it. Such a kit will not be of any use to you. The second accessory that is very handy is a vacuum attachment. This component is going to go right onto your vacuum cleaner, as it will allow you to vacuum inside the area of the dryer where the lint filter goes. That area is often full of lint, which is hard to reach with your bare hands or a manual contraption. Using the vacuum attachment makes it easy to fish all that lint out. A feature that is not necessary, but is a very good addition, is a round or auger brush. Having such a brush in the kit is very handy, as you can use it to get into very tight and narrow spaces within the dryer. 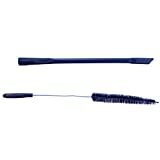 These brushes are designed specifically to use in dryer vents and other parts of the machine. They are able to rotate and change their shape as you are moving inside the dryer, giving you maximum maneuverability as you are searching for every bit of lint inside the machine. With a dryer vent cleaning kit, you will never have to worry about a malfunctioning or potentially dangerous dryer again. All the lint that is building up inside your dryer, whether it is in the crevices, vent, hose or duct, will be easy to remove. Even a monthly cleaning using the kit will do a great job. If you were stuck on identifying the ideal dryer vent cleaning kit, we hope that our guide has made your life a little easier. When price is not a consideration, we believe that Gardus RLE202 LintEater is the kit that you should choose. It offers the best accessories and performance of all the models.